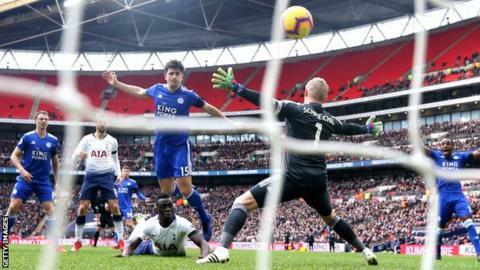 Tottenham ensured they remain in contention in the Premier League title race as Mauricio Pochettino's facet attained victory over Leicester at Wembley. Spurs had to weather a late Foxes fightback to remain third in the table after 26 games, but reduced the deficit to leaders Liverpool - who beat Bournemouth on Saturday - to 5 points. Christian Eriksen provided a pin-point cross to set up Davinson Sanchez's 1st Tottenham goal after 33 minutes, before producing a moment of quality to double the hosts' advantage from the edge of the area in the half. The Dane's strike came simply 3 minutes after omitted Leicester striker Jamie Vardy emerged from the bench in dramatic fashion to take a penalty on the hour mark - only to be denied by goalkeeper Hugo Lloris. Vardy made a demonstrable difference to Leicester's attack and converted from Ricardo Pereira's low cross to set up a tense finish, before the in-form Son Heung-min made certain of a home win in stoppage time. It's a fourth consecutive league win for Tottenham who remain in touch at the top, simply 2 points behind second-place Manchester city who face Chelsea.